ATN NVWSM41010 Aries MK 410 Spartan Night Vision Riflescope FREE SHIPPING! The Aries MK 410 Spartan Night Vision Riflescope is powerful, entry-level night vision optic ideal for both tactical operatives and nocturnal hunters. Improved optic arrangements and high-end, multi-coated lenses offer increased light transmission for brighter and clearer image resolution than ever before. When no light is available, the scope utilizes the strongest infrared illuminator on the market to provide needed ambient light for a clear image. An adjustable red-on-green illuminated reticle shows up clearly on both light and dark backgrounds, allowing for quicker and more accurate shot placement especially from greater distances. The generous eye relief works perfectly with the scope's 5x image magnification to deliver rapid target acquisition of faraway subjects. The whole system is housed in an ultra-durable, aluminum tubing that is built to handle the demands of tactical operations. Its weather-resistant seals and shock absorbing body allow for versatile use in virtually any tactical environment. 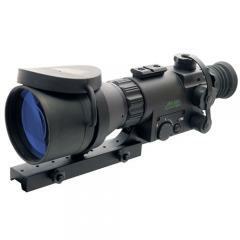 ©2002-2019 CopsPlus.com: ATN NVWSM41010 Aries MK 410 Spartan Night Vision Riflescope FREE SHIPPING!